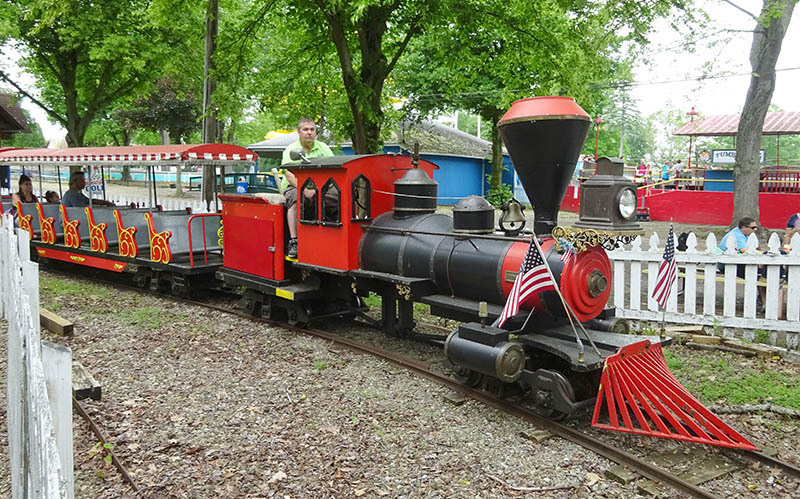 A miniature train takes passengers for a journey through the woodlands and past Conneaut Lake Park's historic Blue Streak rollercoaster. Conneaut Lake Park's miniature railway (sometimes known as "Bessemer Railway System") was built by the Allan Herschell Company, and opened for the 1968 season. At one time it ran modern style trains built by the National Amusement Device Company, who also provided new trains for the Blue Streak rollercoaster in the 1960s. These have since been replaced by a steam locomotive looking engine. In 2006 the park launched a "Brick-by-Brick" fundraising campaign, which raised money which was used to help repair the railway. The train takes visitors into the woodland, travelling beside Blue Streak out to the picnic grove near the park's front entrance. Circling around, it journeys back into the park. Running through a gap underneath Blue Streak's track, it makes a figure of eight loop around the mini golf course before returning to the station.